Mcguire Trucking Service is completely authorized company with numerous long periods of involvement in the business. As a result numerous Property Managers, Residential mortgage holders, and Commercial organizations relied on us for proficient flatbed trucking requirements. From many years, we are committed to helping our customers haul nearly any type of load safely and efficiently, but we are specialized in delivery of over dimensional loads which may include oversized equipment, lumber generators, electronic switches, commercial garage doors, manufacturing machines, air-conditioning rooftops and so much more. In order to provide more satisfactory services, we have added a new Air Ride Flatbed Service to move your most critical loads which needs highly specialized flatbed trucks with air ride suspension system. McGuire Trucking Service in East Meadow NY can help with a shipment, from 100 pounds to 16,000 lbs, our fantastic customer service team will make your entire logistics experience as smooth and hassle-free as possible. Our fleet of flatbed trucks is being driven by the trained professional drivers only to move any type of load with safety and security. We are available round the clock to offer superior and challenging services in East Meadow NY. We are leaders in Hotshot Trucking service, Air Ride Flatbed Trucking service, Commercial delivery, Express trucking, Residential Freight delivery, Local trucking, Rush Messenger, Lift gate, Warehousing and Distribution. Rather than just fulfilling the trucking aspect, we ensure that a professional team manages every step of getting your goods from one point to another. 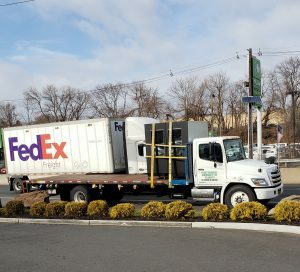 McGuire Trucking Service East Meadow NY offers its customers superior service and great rates, whether the delivery and pick-up is residential or commercial. It includes the use of air cargo, truckload, LTL, dry van, or flatbed trucking methods. It doesn’t matter if your company specializes in one product or thousands of different products, McGuire Trucking Service have the means to transport your cargo, even if you have special requirements in East Meadow NY. We at Mcguire Trucking Service are eager to answer your every query. Give us a call at 631-580-4777 today to schedule your hauling appointment. Contact us for free Flatbed shipping rates. At Mcguire Trucking Service, we maintain highest safety standards to move your most critical loads anywhere in New York area. We are fully capable of catering all your flatbed trucking needs, moving your over dimensional load, heavy machinery, fully grown trees etc. We have variety of flatbed trucks, pick up delivery trucks in our fleet to provide total trucking solutions in East Setauket NY to our esteemed customers. In order to provide more satisfactory services, we have added a new service to move your more critical loads which needs highly specialised flatbed trucks with air ride suspension system. It is simply a better shock absorption system in which the trailers cargo actually floats on a cushion of air, nearly eliminating both compression damage and telescoping and hence ensuring that your cargo is transported as safely as possible by minimizing any major shocks or excessive bumps that can possibly cause damage to your fragile freight. 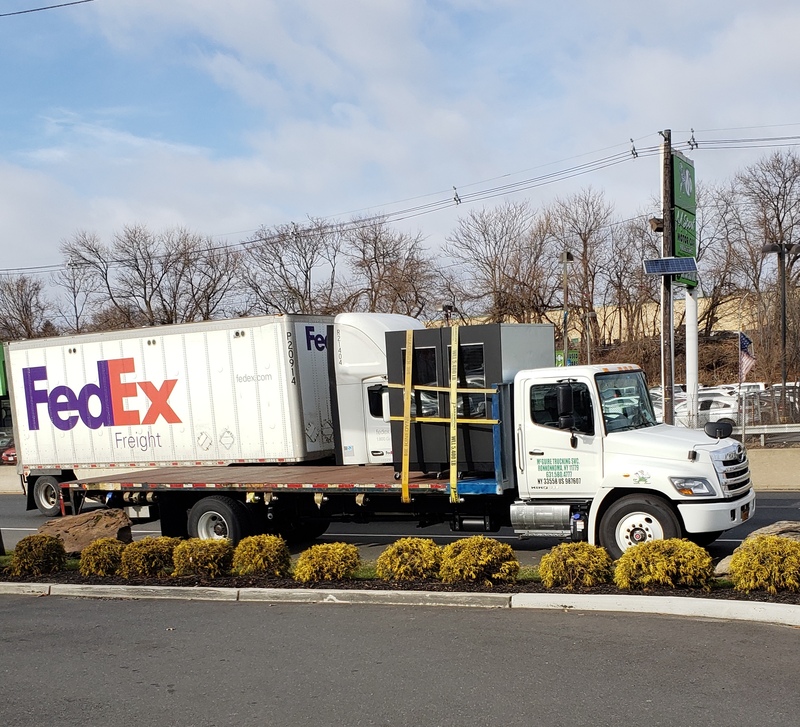 These air ride flatbed trucks in East Setauket NY are frequently used to transport oversized materials that cannot be shipped with any other transportation method. Flatbed truck freight is easily accessed by forklifts, which can quickly and effectively remove freight upon arrival at the job site. 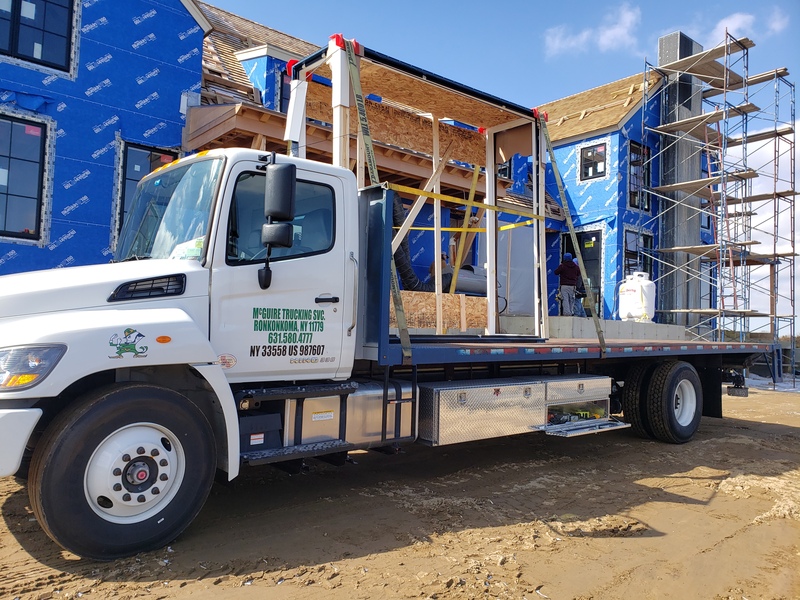 Air ride flatbed trucks are generally used during the building construction process to transport building materials and building-essential appliances, as opposed to finishing materials like tiles, kitchen appliances, and more. Expedited freight that must travel by ground. Roadside cargo control, featuring stake pockets, combo sliding winches for maximum load security. Air-ride suspensions, equipped with self-regulating height control valves 27Ft Straight-frame flatbed with Liftgate. Our professional staff, round the clock pre and post-delivery support system, experienced drivers makes us one of the most committed flatbed trucking Company in East Setauket NY. We can handle shipping of any type of load and can customize the delivery chain as per your requirements. Our competitive and affordable rates make us one of the leading flatbed trucking company in NY area. Give our team a call at 631-580-4777, if you have any concerns or queries about pick up or delivery anywhere in East Setauket NY. As if our versatility and customer service weren’t enough, our rates are the best, whatever your shipping needs. Working with McGuire Trucking Service is a hassle-free experience all the way around! We are experienced and having all the necessary resources to provide you with best flatbed trucking services. We always make sure your shipments get where they need to go as efficiently as possible. From many years, we are committed to our customers for giving full value of time and money by doing the hauling for them. We have successfully completed many challenging jobs in the past by transporting all sort of loads with guaranteed safety. Our Flatbed and Box trucks are regularly maintained and ready to pick up from wherever it may be in New York City Warehouse, Distributor, storage, construction site, or Job Site. Give us a call today to schedule your hauling appointment. McGuire Trucking provides same day and time-critical deliveries to Long Island, Yaphank, Jamaica, Queens, Brooklyn, Bronx Manhattan, NYC. We are committed to the customers and give full consideration to every aspect to ensure safety and security of their load. At Mcguire Trucking Service Yaphank, you can rest assured that your assets are receiving the care that they actually deserve. Contact us for a free Flatbed shipping rates.